Typhlosion, The Volcano Pokémon. Typhlosion obscures itself behind a shimmering heat haze that it creates using its intensely hot flames. This Pokémon creates blazing explosive blasts that burn everything to cinders.It has a secret, devastating move. It rubs its blazing fur together to cause huge explosions. The final stage of Cyndaquil, Typhlosion fits the standard mold of average Fire Pokemon with high Speed, high offensive stats, but low defense. 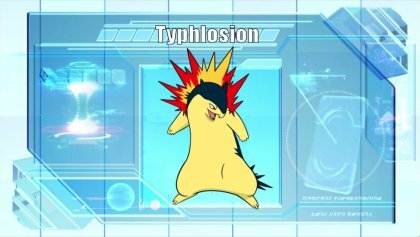 However, this sometimes comes with a poor movepool, which Typhlosion suffers with. This would make Typhlosion languish in the depths of PU if it wasn't for Eruption, being one of few evolution lines that gets it, most of which are legendary Pokemon like Groudon. This makes Typhlosion the best user of Eruption in the lower tiers due to its high Speed, allowing it to aim for OHKOs and avoid the health loss that drops Eruption's power. +Eruption - The raw power of Eruption is a major upswing for Typhlosion. With 150 base power when at full health, and having 100 base Speed, Typhlosion can outpace a lot of threats and pull off OHKOs or 2HKOs on most of the threats it sees commonly, barring bulky Rock- and Water-type threats. This makes Typhlosion a threat that can't be taken lightly and can act as a cleaner or a wallbreaker. +Flash Fire - With Flash Fire, Typhlosion can be more aggressive on looking for switch-ins with an immunity. Even most Fire-types can't stand up to the firepower of Typhlosion, being clean 2HKOes, bar Houndoom, Ninetales, and other Typhlosion who also carry Flash Fire. -Outclassed - Outside of Eruption spamming, Typhlosion struggles to assert itself as a Fire type over others in tier. Delphox is faster than it making it better with a Choice Scarf as well having the option of carrying Trick. Emboar just hits harder overall and has better bulk, while Houndoom brings more Speed and more base Special Attack, but lacks the firepower of Eruption. Finally, Charizard is a better sweeper with Z-Sunny Day and Solar Power. All this and Typhlosion's lack of a secondary STAB move hurts its overall effectiveness. -Movepool - On paper, Typhlosion has a strong movepool, but a closer look reveals that most of those strong moves are physical moves. Without access to Swords Dance like Charizard, Typhlosion can't make use of its varied physical moves like Earthquake, Thunder Punch, and Shadow Claw. Eruption is the staple move for Typhlosion and the main reason that you will be using it over other Fires. Choice Specs are the best choiced option just to maximize the firepower, but Typhlosion can use a Choice Scarf and act as a revenge killer. 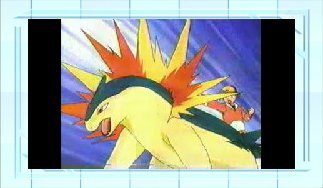 Fire Blast is a secondary STAB move for when Typhlosion has taken too much damage for Eruption to really pack a punch. Focus Blast is the next move, hitting Rock type threats and others such as Guzzlord, Houndoom, and Rhydon hard. Hidden Power Grass rounds it out as an option to help break through Rock threats such as Rhydon, Omastar, and Kabutops, while Extrasensory hits Hariyama hard, who otherwise is a pain to deal with due to Thick Fat. Extrasensory also hits Hitmonlee and Toxicroak, although the former is hit harder by Fire-type moves and latter gets torched due to Dry Skin giving an effective weakness to Fire. Choice Scarf - As mentioned in the set details, Choice Scarf is a strong option for Typhlosion to make up for its average Speed, allowing it to catch some Choice Scarf users by surprise with Eruption. However Delphox is generally superior in this role with Trick and its 104 base Speed. Hazard Control - With how Eruption works, Typhlosion demands hazard control close to the level of Charizard or Volcarona. Hitmontop is a top contender with Intimidate to scare off some common hazard setters, but will lose to Qwilfish. Kabutops is in a similar boat, but loses to Rhydon if it goes for a cheeky Earthquake instead of running away, and can become setup fodder for an aggressive Omastar. Shiftry is a strong Defog user who can also switch into most hazards setters and win a 1v1, but Defog will remove your hazards as well. Finally, Xatu can both bounce back or Defog away hazards as well as go head to head with Qwilfish, Omastar, and Rhydon due to its Speed and access to Grass Knot. 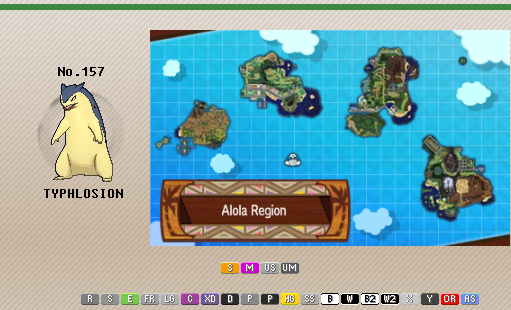 This makes Xatu the superior answer on paper but it still requires a level of prediction to see true effectiveness. Pivots - With the nature of Eruption, any free switches Typhlosion can get are a major benefit, meaning U-Turn, Volt Switch, and Parting Shot users are some of its best friends. Alolan Persian is the best Parting Shot user, and when used with a Darkium Z acts like Healing Wish, healing the incoming Pokemon to full which is massive for Typhlosion. However Alolan Persian has a hard time standing out from Liepard due to its access to Prankster. U-Turn wise, Accelgor has the best utility, as it can Spike up and U-Turn away, making it easier for Typhlosion to secure kills. Braviary can just plow through teams with its power, even softening up Rock checks it shares with Typhlosion. As for Volt Switch, Rotom-Cut is the best user of it, checking Rock threats with Leaf Storm/Bloom Doom and brings Will-O-Wisp and Defog support. Normal forme Rotom is still a decent option as well as Rotom Frost, but Blizzard's accuracy hurts the latter and Rotom isn't very tanky while also suffering a weakness to Pursuit. Hazard Setters - Hazard Setters are a nice bonus for Typhlosion as it helps it secure some kills that would otherwise be a problem for it to get, or handle in general. Accelgor is nice on the offensive side with its Spikes, high Speed, access to U-Turn to maintain pressure. In a similar vein is Froslass who can Taunt out a lot of other hazard leads before creating a free switch in with Destiny Bond. Omastar can set up both Spikes and Stealth Rock while maintaining offensive presence with its high Special Attack. Another option Rhydon who is just a straight tank with Eviolite and its high Attack stat, but is slow and has a quad weakness to Water which is already a problem for Typhlosion. Alternatively Qwilfish brings Toxic Spikes in exchange for its lack of Stealth Rock, as well as Explosion and Haze, the latter of which can be a full health heal with an Icium Z. Having access to Flash Fire, Typhlosion gained new life that allows for it to be more competitive for Doubles formats. Admittedly, it is a lackluster option though it should not be slept on considering that with the right support it can deal massive damage. With access to Eruption, Typhlosion becomes an explosive source of damage under the Doubles format because you're hitting the opponent with one of the strongest spread moves available in the game. Pair it up with a Sunny Day setter, and this Pokemon becomes a beast under the sun. Fire Blast has lasting power in case you decide to switch it in later at a lower health where Eruption no longer deals as much damage. Alternatively, you can choose to use Heat Wave which remains a stable spread move that will hit both opponents at once. Focus Blast offers Fighting-type coverage, which gets further boosted by Choice Specs. Hidden Power Grass can be an option if you have no plan to use Typhlosion under the sun. However, Solar Beam if paired under the sun is a much more potent alternative to deal with pesky Water-type Pokemon. Extrasensory deserves an honorable mention as it offers coverage for certain Pokemon that might need to be dealt with, especially several of the fighters that rely on Intimidate. Choice Specs is the best option for damage output. Flash Fire is self explanatory, and immunities are always welcomed. - Flamethrower can be used over Fire Blast if you prefer consistency over the possibility of missing. - Hidden Power Ground aids against popular Pokemon of the Doubles format, such as Heatran or Stakataka. - Life Orb offers freedom to switch between attacks at the expense of power, though this has poor synergy with Eruption. - Choice Scarf makes it less dependent on Tailwind support to outspeed foes but gives up a lot of power that Typhlosion needs. Water Types - Typhlosion struggles to break through a lot of Water-type threats, the most prominent being Assault Vest Slowking who can threaten Typhlosion with Scald or Dragon Tail while healing most of the damage it takes from Eruption with Regenerator. Slowbro can set up Calm Mind on Typhlosion but can lose depending on the hazards in play. Jellicent falls into a similar area but is naturally a bit tankier on the special side than Slowbro. 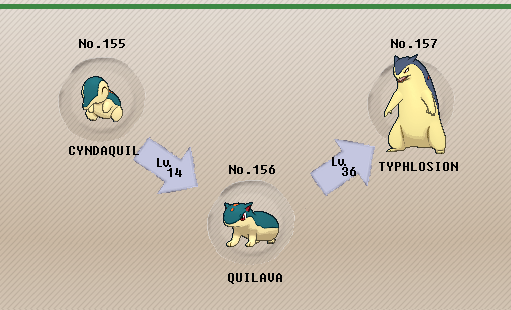 Lastly Rock/Water threats such as Omastar and Kabutops quad resist Eruption and set up on Typhlosion, but both have to be wary of Hidden Power Grass which will KO them easily. Rock Types - Similar to Water types, Typhlosion has a slightly easier time with most Rock threats due to their inherently lower Special Defense. However, Rock threats such as Rhydon that can use Eviolite can cover this problem and be powerful tanks that really ruin Typhlosion's dreams. Golem is in a similar boat, but lacks access to Eviolite. Both Omastar and Kabutops need to watch out for Hidden Power Grass, though they are strong answers otherwise. Alolan Golem does decently against Typhlosion as it doesn't take 4x damage from Hidden Power Grass but has to be wary of Focus Blast, otherwise it is still a notable threat. Lastly, Shuckle can set up Stealth Rock on Typhlosion but gets 2HKOed by Eruption, likewise with Aggron. Dragon Types - For the first time, there's a decent amount of Dragons in the lower tiers that threaten Typhlosion. Altaria just sponges up hits and heal it off with Roost, but outside of Toxic it can't do a lot to Typhlosion in return. Guzzlord can also sponge some hits with its insane base HP and can go for a KO back with Choice Specs Draco Meteor, but has to be careful of Focus Blast. Even without Focus Blast, Guzzlord can't sponge up more than 3 hits for Eruption. Drampa is similar to Guzzlord but with less health in exchange for a bit more Speed, which means nothing in the match up with Typhlosion, and still has to be wary of Focus Blast. The best Dragon matchup is Druddigon, who lacks any secondary weakness, bar low Speed that Typhlosion capitalizes on, and has access to Earthquake and Glare. Druddigon also has Mold Breaker and Stealth Rock, meaning Xatu cant block its Stealth Rock either. While it can't sponge a lot of hits, especially when running offensive sets, Druddigon is a major threat to Typhlosion.